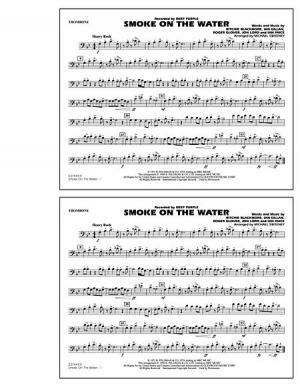 Smoke On The Water - Trombone by Deep Purple. By Jon Lord, Ian Paice, Ian Gillan, Roger Glover, and Ritchie Blackmore. Arranged by Michael Sweeney. Marching band. For Trombone. Rock. Individual instrument part. 1 pages. 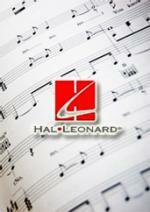 Published by Hal Leonard - Digital Sheet Music (HX.133637). This item is the replacement part to the marching band set. It is not recommended to purchase this as a solo piece. 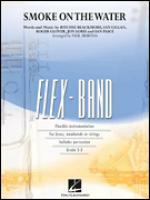 Instantly downloadable sheet music by Ian Gillan for band of MEDIUM skill level. Instantly downloadable sheet music by Roger Glover for guitar of EASY skill level. 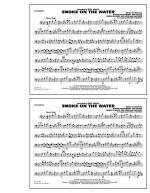 Instantly downloadable sheet music by Roger Glover for guitar of MEDIUM skill level.